Again this year, these exclusive project bags are hand-crafted by one of this year’s co-hosts, Silvia Mendoza of Not Knots. A little larger than past years’ bags, these are approximately 10 inches tall, 10 inches wide with a 3 inch reinforcing casing band and a 3 1/2 inch gusset which makes for a generous rectangular base; ample room for most knitting and crochet projects. They are fully lined with brightly-colored coordinating gamer & candy-themed fabric. 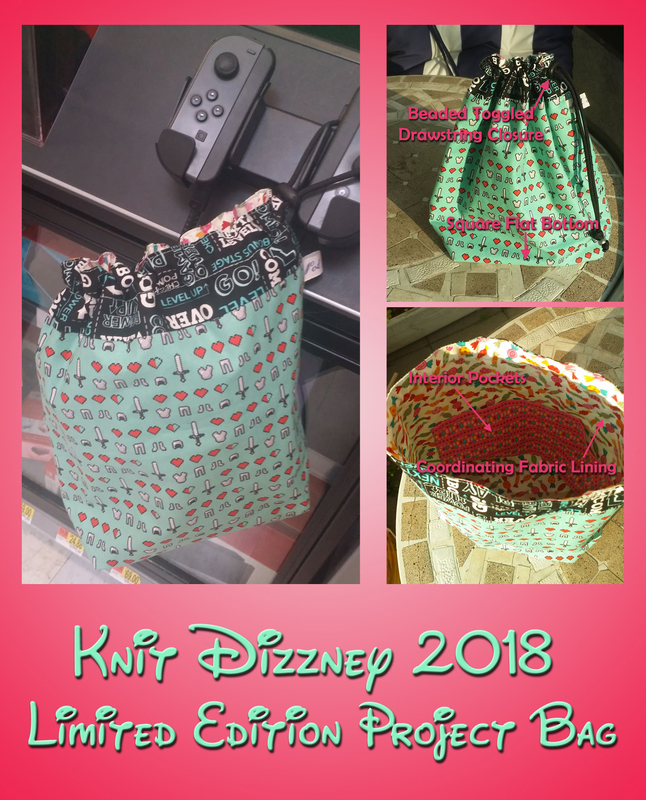 This year’s bag also features two 4-inch pockets in a thematically color-coordinating fabric and features Not Knots’ signature needle/hook pocket. The price for these bags are $28 each. There is an extremely limited quantity, so get them while supplies last. Quantities will be limited to one per customer, or one per bundle*. Pre-orders will open around August 6th. Orders will be filled in a first-come, first served basis. But when they’re gone, they’re gone! So mark your calendars for AUGUST 23, 2018 to make sure you get yours before they’re all sold out! Where can we order? It’s 8/7 and I don’t see any order forms on anyone’s websites for these or for your colorway. All I can see is where to buy Lazer Sheep Yarns colorway–and ONLY that one. Hi Kerry! I LOVE your enthusiasm! Alas, I have yet to post my colorway…but stay tuned, I’m working on that post right now!